Still one day ahead of schedule, we trekked a bit over 9 miles during a drizzle from the very start. We sloshed through muddy paths going between fields, but vowed to stay on paved roads, especially after falling in the mud. The day started with our hosting pastor introducing Eddie and me at mass and mentioning that we were the first pilgrims and first Americans in his church (built, incidentally, in 1699!). After a huge breakfast and sandwiches made to go, we basically headed north to Jaroslaw, a city founded in 1031. The pastor had called ahead to arrange a room at the Monastery of the Benedictine Sisters founded in 1611. Our Spartan room (that makes a Motel 6 seem luxurious) is rather modern belying the cloister’s erection on 1635! We’re on grouds surrounded by defensive walls with eight observation towers. Although we’d like to see more, our chores of washing clothes and removing today’s mud left little time. Just happy to look outside at one of those towers. 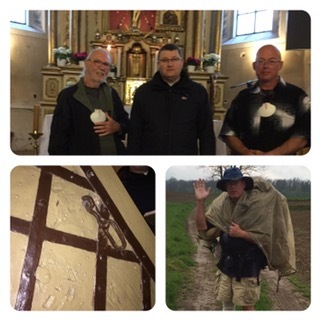 The first pic shows our host last night in front of the church’s altar, a close-up of damage the Ottomans wreaked on a side door while trying to break into the church looking for gold (1700s some time) and a sampler of our mud encounter. The second pic shows the entrance to the monastery, one of the towers and a glimps at modern austerity. The first thing I do is look up your route on the map. Today it was from Rokietnica to Jaroslaw. Then Tom and I read your post and look at your pictures. Quite amazing the priest announced you are the first pilgrims and first Americans in his church. And what an old one at that! He will always remember you. And again you were treated to wonderful hospitality. Nine miles in wet weather on muddy paths is a challenge. I wonder what kind of rain gear you have with you. Now you are settled in, guests at the monastery, and got some things done. The tower is pretty amazing. If it and it’s 7 brothers could talk, they probably have a lot of historical stories to share. The room is austere but looks ok and meets the needs. I’m following you every step of the way! Bless you.